The city is tracking 62 vehicles using Esri Tracking Server and Tracking Viewer. Vehicle history can be adjusted from a few minutes up to several days of vehicle use. Data can be easily viewed in real time using a Flex-based web map application. Located in the southeast portion of the Salt Lake Valley, Sandy City is nestled at the base of the Wasatch Mountain range and is just minutes away from Utah's famous world-class skiing. Sandy is the sixth-largest city in Utah, with a population of more than 87,000 residents. The city covers a total area of about 23 square miles and contains a network of city-maintained streets spanning over 300 miles. Like most municipalities that are this size, keeping the roads safe, clean, and well maintained is no easy task. Sandy City's Public Works department removes snow from these streets in the winter, sweeps and maintains them in the summer, and offers bulk waste cleanup to all residents twice a year in the spring and fall. Tree branches being chipped for mulch during Sandy City's spring bulk waste cleanup. The Public Utilities department has vehicles throughout the city as well, maintaining the underground infrastructure of waterlines and storm drains. Public Utilities employees routinely inspect city wells to ensure safe drinking water and are responsible for the upkeep of all city-owned streetlights. At any given time during the day, these two city departments have vehicles citywide, delivering the important services at the high standards the citizens have come to expect. Both of these departments recognized the importance of tracking their fleets of vehicles by using an automatic vehicle location (AVL) solution. Specifically, to ensure that the vehicles are being used efficiently, keep residents and employees safe, and monitor vehicle use, Sandy City needed a way to track its fleets. It was determined that an AVL solution was needed that provided real-time data of vehicles, to be updated frequently, and the ability to store this data for analysis. Initially, an AVL tracking service was set up using an outside company. Though department management was able to view a vehicle's location, speed, and direction of travel in real time, ownership of the data and monthly expenses for this service became an issue. Furthermore, a backlog of only eight hours of data was kept available for analysis. It was decided that the city needed to take more control of how the data was being stored, accessed, and viewed. After carefully reviewing options from several sources, Sandy City decided that Esri Tracking Server offered the best solution to monitor and record its fleets of service vehicles. Because Sandy City already used Esri products to store and manage its GIS, it was apparent that adding Esri Tracking Server was an easy choice. 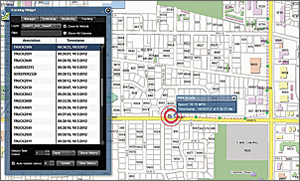 Not only could the server be modified to receive vehicle information from existing modems already installed in vehicles, the data could also be easily viewed in real time using a Flex-based web map application; this viewer was customizable to fit the city's needs, and data could be stored in the enterprise geodatabase, where it could be accessed for analysis at any time. Since implementing Esri Tracking Server in February 2012, the city has continued to add vehicles, as well as expand the way this data is viewed and used. With the help of Esri Professional Services, a customized vehicle tracking widget was created for the Flex-based viewer. This widget allows the user to subscribe to a service based on department, track a specific vehicle within that department in real time, and view a bread crumb history of where that vehicle has been. The vehicle history can be adjusted from a few minutes up to several days of vehicle use. Since this information is retrieved directly from Sandy City's enterprise geodatabase, the data is displayed quickly and stored safely. 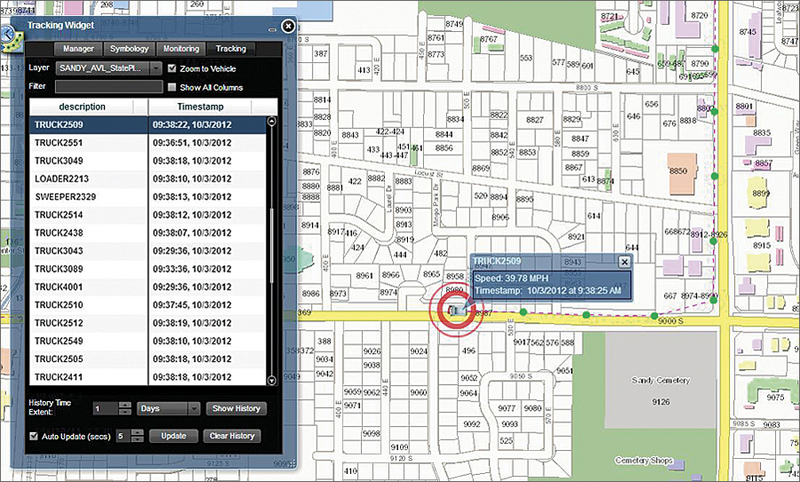 The tracking widget displays all the currently active vehicles on a map of the city, and a pop-up window quickly gives any particular vehicle's current speed and an accurate date/time record down to the second. Vehicles are easily identified by type using customized icons that reflect the actual direction the vehicle is traveling. Using the tracking widget to track a city plow truck. Vehicle data that is logged with the enterprise geodatabase is archived monthly as its own feature class. This feature class is then added to a vehicle archive history map service, which is used by a modified search widget on the viewer and enables the user to view a prior month's vehicle history by selecting either a vehicle or a specific area of the city. All this means that management can easily bring up information on any vehicle's location, anywhere in the city, at any given point in time. Sandy City's Public Works department has found Esri Tracking Server particularly useful to monitor its fleet of work vehicles year-round. In the winter during snow removal season, it is very important to be able to track where a vehicle is at all times, day or night, and to be able to dispatch a vehicle to another high-priority location if needed. Furthermore, a concerned citizen can receive accurate information concerning the last time a street was cleared of snow or if a city vehicle may have been in the area when damage occurred. Tracking vehicles has become an asset both in planning routes and preparing for the next snowstorm. "The GIS software has been a very useful tool for training our drivers," says Paul Browning, Sandy City's Public Works assistant director. "During the winter, we can look at the vehicle history after a snowstorm and show the driver how to more efficiently plow his area of the city." In the spring and fall, Public Works department trucks are busy picking up and hauling away bulk waste from residents. Using the Esri Tracking Viewer web map application, street supervisors are able to see which neighborhoods have been visited and schedule areas that still need to be cleaned up. During the summer months, street sweeping, machine leveling, and routine maintenance take place. 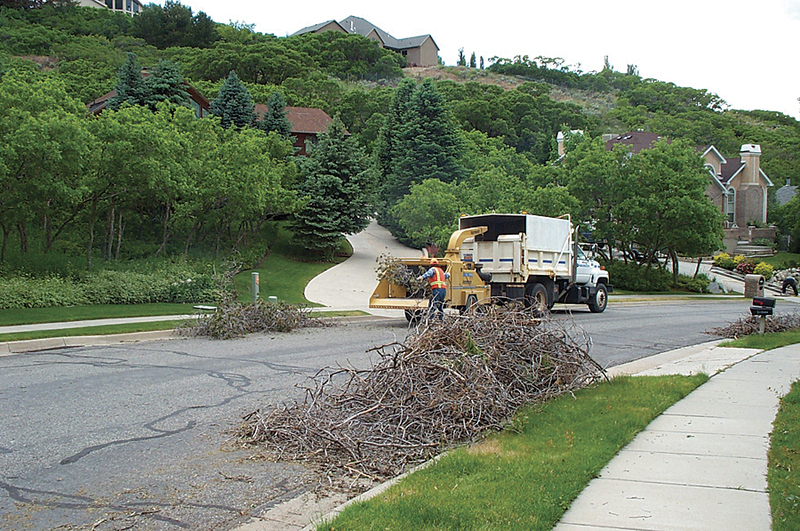 The software has helped Sandy City employees keep their streets clean and well maintained. At the current time, the city is tracking 62 vehicles, including standard work trucks, 10-wheeled dump trucks, street sweepers, front-end loaders, and bucket utility trucks. Though only two departments in the city are currently using Esri Tracking Server and Tracking Viewer to monitor their vehicles, future use may expand to other departments throughout the city, and many more vehicles are expected to be added to the system. As the city continues to develop GIS services, a simplified web map application may be offered to the public to access information concerning vehicle locations. Sandy City also hopes to continue to enhance how the vehicle history data is accessed and analyzed to further streamline workflow, improve city services, and continue to encourage safe and efficient driving practices throughout the city. Ryan Kammerer is the GIS coordinator for the Sandy City Department of Public Works. He has earned a master's degree in geographic information technology from Northeastern University, Boston, Massachusetts, and is fascinated with technology and computer science. Having worked for several municipalities, he is passionate about using GIS to improve city workflows and operations. For more information, contact Ryan Kammerer, GIS coordinator, Sandy City Department of Public Works, or Chad Helm, Esri.